Keyword This is the default search option. If you are conducting general research on a topic and you don't have anything specific in mind, searching by keyword provides the most flexibility. Title If you're looking for a specific item, select Title from the dropdown menu, and type in the item's exact title. If you get zero matches, check your spelling. You may also want to check Google to ensure your title is correct. Author If you're looking for books by a specific author, select Author from the dropdown menu, and type in the author's last name first. For example, if you're searching for books by Mark Twain, you'd type [Twain, Mark] into the search box. The Library's catalog contains more than just books. You can also search for journals (both print and electronic), videos, music and music scores, and course reserves. You can also search for and access ebooks through the catalog. Research Guides If you need articles in a specific subject area but don't know where to start, you can visit our Research Guides. On the homepage, the Research Guides link is located in the "Quick Links" box on the left. The list is also available via the Research Guides tab in the Research Toolbox located in the middle of the Library's homepage. Here you will find a selection of guides organized alphabetically by subject. Select the guide that most closely matches the subject area you're researching, then click on the Find Articles tab across the top. This will lead you to a list of databases where you can find information in your specific subject area. A-Z Resource List If you need to access a specific database, click the Databases tab in the Research Toolbox located in the middle of the Library's homepage. Opening the drop-down menu will display an alphabetical listing of all 300+ databases available through the Gregg-Graniteville Library. Electronic Journals If you are looking for a specific electronic journal, or if you have an article citation and you're trying to find the full-text, click on the E-Journals tab in the Research Toolbox, then follow link provided. You can browse journals by subject, or you can use the search box to search for specific journal titles. 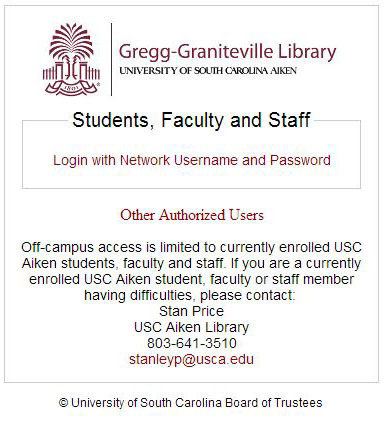 Due to license restrictions limiting usage to USCA students, faculty and staff, access to USCA Library online databases from off-campus requires a login. Citations If you need help with citations, our Citation Tools page contains handy quick reference guides, easy-to-follow video tutorials, and links to other helpful websites. Several different citations styles are covered, including MLA and APA. You can find this page by opening the Research tab in the upper left corner of the Library website and clicking on Citation in the list. Avoiding Plagiarism The correct use of citation styles is one way of Avoiding Plagiarism. Learn about different forms of academic dishonesty, common reasons students plagiarize, and how to avoid it.